When it comes to choosing where to go for your ski holiday, there seems to be millions of options out there. First things first, you need to narrow it down to continent. The two heavyweights are the French Alps in Europe, and the Rockies in North America. We’re aware most people don’t have the time to go trawling the internet for hours doing research. That’s why we’ve done the hard bit for you. We’re putting the Alps and the U.S. head to head to find out, once and for all, which is the ultimate skiing destination. 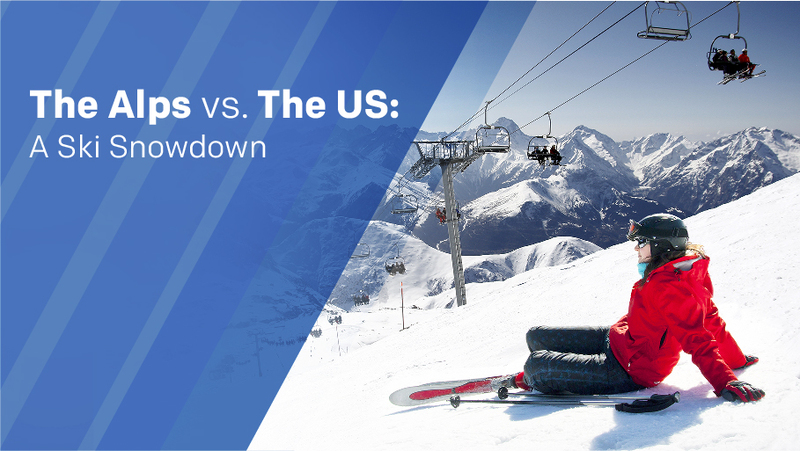 This is the Alps vs. the U.S: a ski snowdown. This is a hard one. Both the French Alps and the Rockies have great options for beginners. The things to consider if you’re new to the slopes are the number and quality of blue and green runs available, the size of the nursery area and whether the resort has good ski schools. Avoriaz is a great choice for newbies. Located in the Portes du Soleil ski area, the resort offers excellent, high-altitude skiing and gorgeous panoramic views. What makes Avoriaz good for beginners is the sheer choice of easier slopes and ski areas. The Ecoles or Dromontes pistes in the centre of the resort are a great place to try out the ropes. Once you’ve got the basics down, you can progress to the easily accessible green slopes or the four gentle blue slopes in the area. Avoriaz is home to plenty of quality ski schools for adults and children alike. Learn with a professional ski instructor to get the most out of your trip. Separate beginner lifts, easy runs and wide slopes make Beaver Creek a strong contender for beginners. The runs at Bachelor Gulch and Arrowhead Mountain are particularly good for novices and there are even practice lifts to take away some of the stress of getting up the mountain! Another good thing about the USA, is the wealth of excellent ski schools with native English-speaking instructors. Beaver Creek gets raving reviews from visitors. The only problem is that a ski season here doesn’t come cheap. Looking for a ski resort with added thrills? The Three Valleys in the Alps has a vast area for more practiced skiers to explore, while the USA boasts relatively safe off-piste skiing adventures complete with ski patrollers looking out for injured skiers. The Three Valleys is situated high up in the peaks of the Alps and consists of a huge range of interconnected mountains for intermediates and experts of all levels to get stuck into. All accessible with a single ski pass, the skiing possibilities are almost endless. It helps that the alpine resorts of Meribel, Courchevel and Val Thorens that make up the area are all charming villages. Jackson Hole is renowned for being the most challenging ski resort in North America, attracting daredevils from all over the world. The Corbet’s Couloir run is the steepest, with one section at a hair-raising decline of 50 degrees! There’s also 200 acres of new terrain to explore. However, due to the low-lying slopes, the sun can deteriorate snow on the lower mountains fairly quickly. Not ideal if you’ve travelled from afar! Both the Alps and the Rockies are areas of breathtaking natural beauty. In France, Mont Blanc, the highest mountain in the alps at over 4,800 m above sea level makes a stunning setting to ski against. While Monte Rosa between the Swiss alps and the Italian alps has stunning ice-capped mountain peaks. The Rockies offer a more rugged setting that stretches for miles. The highest peaks in Colorado are a great place for high-altitude adventure. The real difference between the two contenders is the ambience of the resort villages. Europe is famed for its charming villages complete with pretty wooden chalets and alpine views. Although it is possible to find attractive resorts in the U.S, they tend to be more commercial, purpose-built affairs. You’ll be hard pressed to find a cosy, picture-perfect chalet like the ones in Europe across the pond. Although larger, the apartments found in North America don’t have quite the same magic. We all know a skiing holiday isn’t just about hitting the slopes. A big part of the appeal is kicking back with family and a warming drink at the end of the day or dancing till dawn with your mates at one of the lively après ski spots. That’s why the restaurant and nightlife scene is an important consideration for most. In terms of après ski, we think Europe wins hands down. Europeans seem to have a knack for daytime drinking and wild excess that our American cousins haven’t seemed to embrace so fully. St. Anton in Austria is known for its legendary nightlife and all-night parties. While Val d’Isère in France takes a classier approach to getting hammered. For visitors in search of a more relaxed form of evening entertainment, the culinary delights of France and Italy are world-renowned! For most of us, unless you have your own private jet, cost-effectiveness is a pretty big deal. After all, extra cash for treats like hot chocolate by the fire and fancy meals out are always welcome. In terms of price, European ski resorts in the Alps offer great ski deals on lift passes and special packages which can save a lot of money. Choosing a flight with a budget airline can also prove reasonable. Just watch out for hidden baggage costs when travelling with ski equipment! North American resorts are clearly harder to get to from the UK and Europe, resulting in pricy airline tickets. Lift passes in the U.S. also tend to be costlier and these extras can really add up. Obviously, you can spend a fortune if you opt for a five-star chalet and all the trimmings. For those on a budget, however, it’s pretty easy to keep costs down in the Alps. So, the Alps or the Rockies, which one comes out on top? Really, it depends what kind of ski holiday you’re after. If it’s off-piste freedom and empty slopes you want, you might want to pump for a ski resort in the U.S. But if it’s a vast and varied ski area with an eclectic après ski scene you’re looking for, then Europe wins hands down. For us, the Alps will always have the edge, due to the stunning alpine mountain ranges and traditional village charm you just can’t find anywhere else. If you do decide to visit the Alps this year, then choose the easy option by leaving the transfer up to us! Here at Alps2Alps, we offer reliable, low-cost airport transfers, so you can sit back, relax and recharge before you hit the slopes.